Lieutenant General (ret.) 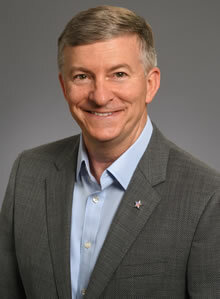 William “Burke” Garrett III has been named Executive Advisor to the Emory Healthcare Veterans Program, a nationally renowned program that provides transformative care for Veterans suffering from post-traumatic stress disorder (PTSD) and traumatic brain injury (TBI). Garrett brings 35 years of leadership experience to Emory. His military service included duties in key command and staff positions worldwide. “We lead to serve, and there is no greater privilege than serving the warriors who bravely stepped up for our great nation,” says Garrett. Garrett’s culminating assignment was Deputy Commander of U.S. European Command where he provided leadership to address complex security challenges across 51 nations in Europe, Eurasia, and the Middle East. He has combat experience in Afghanistan, Iraq and other conflicts. “We are honored that Gen. Garrett has agreed to join our team. His leadership, management skills, compassion and deep commitment to the health of servicemembers and Veterans will help build new partnerships and strengthen our existing relationships with the VA, Wounded Warrior Project and our teammates in Warrior Care Network,” says Emory Healthcare Veterans Program director Barbara O. Rothbaum, PhD, professor of psychiatry and behavioral sciences at Emory University School of Medicine. The Emory Healthcare Veterans Program operates an intensive outpatient program (IOP) and traditional outpatient program for post-9/11 warriors from across the country as part of WWP’s Warrior Care Network. Both programs are at no cost to participants and aim to reduce the symptoms of PTSD, TBI, depression and anxiety, as well as promote health and well-being and improve relationships and social functioning. “Gen. Garrett’s experiences as a warrior in Iraq and Afghanistan and here at home, as a husband and father, and as a leader have given him an acute understanding of the ‘invisible wounds of war’ and the challenges faced by our post 9/11 Veterans across America. He is a strong advocate for America’s servicemembers and Veterans and we look forward to working with him,” says Rothbaum. “It enables and empowers our wounded warriors to live life to the fullest. Being part of an organization committed to this important mission is an inspiration. There is nothing more honorable, nothing more noble, than doing good for others,” he says. For more information on the Emory Healthcare Veterans Program, visit emoryhealthcare.org/veterans or call 1-888-514-5345. Emory’s Veterans Program is part of a collaboration with Wounded Warrior Project (WWP) to offer services to post-9/11 veterans and their families. WWP established the Warrior Care Networkas a nationwide, comprehensive care network that enhances access and provides clinical and family-centered treatment to warriors suffering from PTSD, TBI and other related conditions. The other members of Warrior Care Network are Rush University Medical Center in Chicago, Massachusetts General Hospital in Boston, and UCLA Health in Los Angeles.